Start in the standing position with your feet shoulder width apart. Either place the hands behind your ears with your elbows pointing outward or move a weighted barbell into position across your back. (If you are using a barbell across you back for additional weight, be sure to have control of it before you proceed to do the exercise). With your knees locked or near locked (whichever feels more comfortable), slowly bend forward while keeping your head up and your back straight. Inhale throughout the downward motion. Come to a position that is parallel with the ground. Hold for 1-2 seconds. Return to the starting position while maintaining your form. Exhale throughout the upward motion. Through natural motion of the body, the hips will move back as you bend forward. This is critical to maintaining balance with this exercise, so don't resist this normal and natural motion. 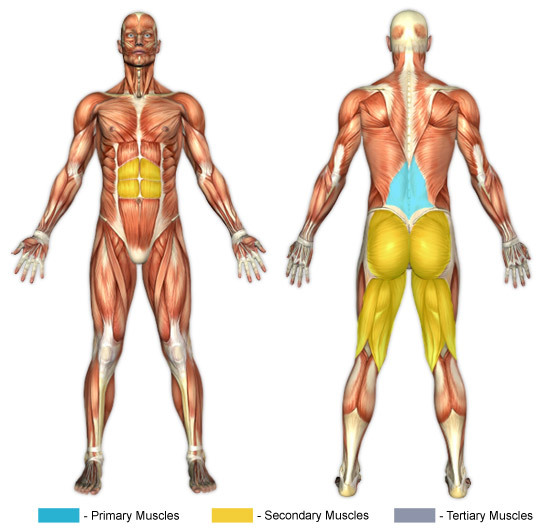 It is worth noting that the buttocks and hamstrings are quite involved in the straightening of the torso. Further, the more weight that is added, the more the buttocks will become involved in the lift. Also, it is recommended to keep the core tight. As noted above, performing this exercise with a barbell across the upper back will increase its difficulty. If you are new to the exercise and want to use a barbell, start with a light weight and work your way up. Do not bend past the point of being parallel with the ground as this may lead to a loss of balance, disorientation, or the barbell (if you are using one) falling. Also, keep the back straight to stave off injury.